There are so many different types of cancers (over 100) and there is such a need for continuous fundraising to increase our research and find cures to eradicate these malignancies from the human experience, that almost every month of the year highlights certain cancers for their focused awareness. She participated in a cutting-edge national clinical trial at the healing mecca of the City of Hope, located in Duarte about 20 miles northeast of Los Angeles, which is one of the very best healing centers on our planet. Kudos to all who work there and especially their hematology oncology department headed by – in my opinion and recognized by most in the medical world – one of the greatest “transplanters” in the universe. His name is Dr. Stephen Forman…and yes, he was Jacqui’s healer. September is also very personal for me as it is also Prostate Cancer Awareness month. I was diagnosed with this cancer in early 2010 and though it was a complicated journey, by that summer I was in remission and very grateful for that outcome. For men, it is the second leading killer after lung cancer. September is also Lymphoma Awareness month and I send a special shout-out to my cousin Albert in Brooklyn who just completed a challenging 3-month chemotherapy lymphoma treatment and all early signs are pointing to his healing. Bravo Al! And I’m also cheering for my cinematography buddy Geoff who battled and won his war against esophageal cancer. Bravo Geoff but you’ll have to wait for your designated awareness month next April! September is quite a busy month for the cancer world…it is also Childhood Cancer Awareness, and Ovarian and Gynecologic Cancer Awareness, and Thyroid Cancer Awareness. We worry about a bird flu pandemic coming to America? In my opinion, we got a pandemic right here called cancer! Almost everyone knows someone who had it, is battling it, or passed away from it. The National Cancer Institute reported more than 1.5 million new cases diagnosed in the U.S. in 2010…and I was one of them! We have to eventually know! It is the only way to beat it. I am well aware this is a tough time economically for America but I implore all who read this to give something to cancer today: $100 or $25 or $10 or if all you can afford is $1 then give that. If you can donate blood to any hospital or cancer center, pick up the phone and go do it. If you can be a bone marrow donor, go volunteer to do that (it’s real easy to be tested) and you can read how at www.cityofhope.org which has a list of donor qualifications for most hospital protocols. To all who are presently battling cancer, we send a big huge HELLO from Jacqui and I and the love and strength to fight on and win your remissions. We dared to dream of our healing, and our dreams came true. May all your healing dreams come true! And to the rest of us, make September special of your cancer awareness. 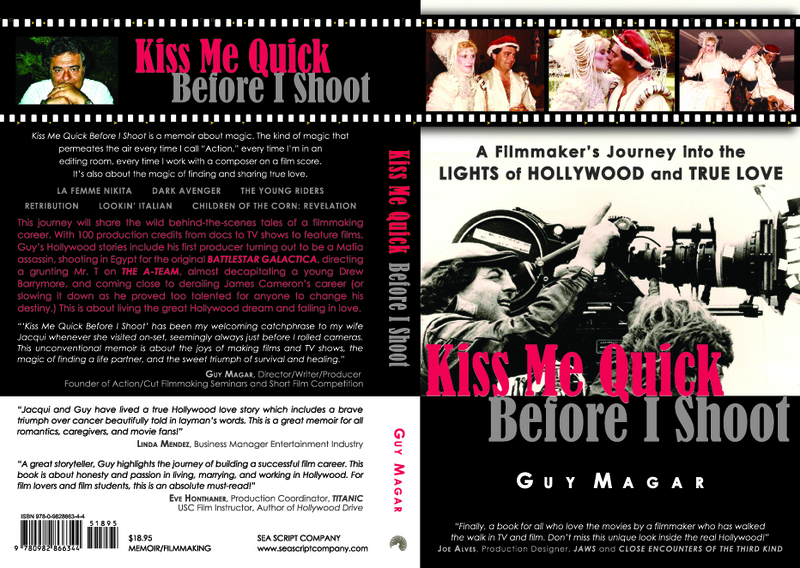 This entry was posted in Book Lovers, Cancer Awareness Month, Leukemia Healing, Romance and Soulmates, Teaching & Education, Uncategorized and tagged City of Hope, Dare to Dream Memoir, Dr. Stephen Forman, General Cancer Awareness Month, Kiss Me Quick Before I Shoot, Leukemia Awareness Month, Lymphoma Awareness Month, Prostate Awareness Month. Bookmark the permalink. It is my hope this blog page can be a place we share our cancer stories. 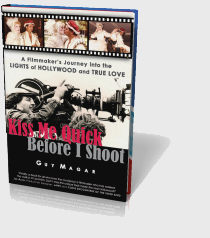 I wrote my memoir Kiss Me Quick Before I Shoot to celebrate the amazing journey not only of my filmmaking career in Hollywood but also of my wife Jacqui’s sudden illness with aml-leukemia. We researched and found a clinical trial of a treatment option involving a stem cells cord blood transplant at City of Hope which was a much milder option than the usual protocol. We’re extremely grateful it worked for Jacqui who is now almost 3 years in remission, and we hope this trial will improve the treatment options for aml. I welcome your comments and sharing of your own stories and just ask to please keep it short and concise. If you can spread the word of this page on Twitter and FB it would be appreciated. Be well and thanks for your visit and participation. Hi Guy, I was just wondering if any of your followers have talked about grade 4 GBM brain cancer? Thank you. The first thing people always remember about Lindsay is her smile. A smile that lit up the room and an attitude that being kind and helping others was most important. It is that smile and attitude that motivates us to push forward each day. Lindsay, Jason and Olivia Lopez were the typical young family. Working hard, having fun and just enjoying life. On Sept 21, 2009 everything changed. That day Lindsay was diagnosed with Acute Lymphoblastic Leukemia. Thus began a journey that nobody ever prepares for. Chemo, numerous medical complications, transfusions, biopsies, months of hospital stays. Since the Doctors knew she needed a Bone Marrow Transplant, the search for a marrow donor began. Being an only child, a sibling match was not an option, so the National Marrow Donor Program “Be The Match” started a search to find the one person in the world that would match. That donor was found in Germany. On June 23, 2010 Lindsay received this life-giving transplant at Froedtert Hospital. The tireless work of the Transplant Team, Doctors, Nurses, technicians and many people behind the scenes helped her recover to return home 5 weeks later. Still weeks of care, countless Doctor visits and finally 3 months later a bone marrow biopsy that showed the leukemia was gone. Hope was restored for a full recovery. A 32nd Birthday celebration was in order. Several weeks later, Lindsay started feeling ill again and more tests were done. The results… the leukemia had returned. Re-admitted to the hospital, strong chemo treatments began again. A month of relentless treatments to fight the evil cancer cells and infections. On Nov 22nd, 2010 Lindsay lost her battle against Leukemia. She fought every step of the way with the heart of a Warrior. Not complaining, just accepting and tolerating whatever procedure she had to endure. While a cure was not to be for Lindsay, we continue to fight to find a cure for this evil disease that is not exclusive – it strikes suddenly and devastates people of any age. Not only affecting the patient, but changing the lives of everyone around them. In 2000, Lindsay’s 1st job after college was working at Children’s Hospital of Wisconsin, as anadministrative assistant in the Pediatric Bone Marrow Transplant Dept. Little did we know, that 10 yrs later we would be praying for a bone marrow donor to save her life. We are grateful for the ongoing research being done at the CIBMTR (Center for International Blood and Marrow Transplant Research) located at the Medical College of Wisconsin. The Doctors, Nurses, Researchers and Clinicians work tirelessly to improve treatments for blood cancer patients. Thank you so much Karen for sharing your story with us. I salute your Trees of Hope organization in Wisconsin and the work you do to eradicate cancer from the human experience. I know Lindsay would approve and be proud of her parents’ work, and her smile will always bless her family. Knowing her story, we will always remember her. When someone is fighting a serious illness, medical bills are only “one part” of their struggle. There are so many facets of their lives that still need to be addressed. I just was introduced to a website that offers a wonderful way to help organize meals, shopping, cleaning, etc that are needed to assist a friend or family member. This goes beyond just illnesses, could also be used for families with physically challenged members, etc. Just wanted to share this: Meal Train http://www.mealtrain.com/ They also have a Facebook Page. Hope this may be useful information for someone.